I went on to tell them about this one dish egg casserole that I brought and why I chose the extra-sharp, how it took what felt like 9 minutes to locate the extra-sharp cheddar cheese in the cheese department, and how I used the English muffins because it’s what I found in my freezer. I love the balance of flavors and textures in this egg casserole. The crushed red pepper gives a hint of heat. The paprika brings a bit of smoky sweetness, and the ham and broccoli work perfectly with the rich and deep flavor of the extra-sharp cheddar cheese. This might just be my new favorite egg casserole. It’s got great bold flavors and it’s rich in taste! The key is using the extra-sharp cheddar. I ended up buying a block and grating it myself, as it was much cheaper than buying it already shredded! So if you have sharp cheddar, or mild. on hand…wait to make it until you can pick up some extra-sharp! So, go dig out that leftover ham from your freezer and get this one dish breakfast, lunch or dinner into the oven! In a mixing bowl, toss together the cut English muffin pieces with the broccoli florets, diced ham and about 3/4 cup of the shredded extra-sharp cheddar cheese. Once tossed, pour into the baking dish. Pour the egg mixture over top of the ingredients in the baking dish. In the morning, sprinkle the remaining shredded extra-sharp cheddar cheese over top of the casserole. Bake, covered, at 375 for 45 minutes. Remove the foil and bake for another 15 to 20 minutes, or until the casserole puffs up and slightly browns on top. 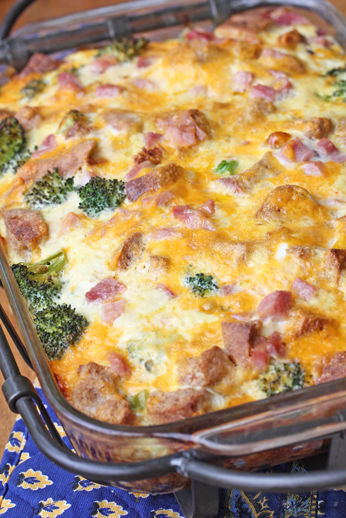 Serve Ham and Broccoli Breakfast Casserole with fresh fruit. Just made something almost exactly like this today except my version had mushrooms. So of course, it looks delish to me! I mozied on over and it looks delicious. Great brunch idea. Oh my, that looks awesome! Thanks! I’ll have to try this. I’m always on the lookout for a new way to make eggs. Would love to get these recipes!